According to a report published today, Apple makes more revenue from their iDevices than all of Microsoft’s products put together. Surprised? The news comes from our friends over at iDownloadBlog who cited a report from Asymco which compares Apple’s revenues with Microsoft’s. Asymco’s comparison concluded that Cupertino’s iPhone, iPod touch and iPad series of products generate more revenue (not profit) than all of Microsoft’s products. The Mac business generates more revenue than Windows. iOS powered devices generate more revenue than all of Microsoft’s products put together. 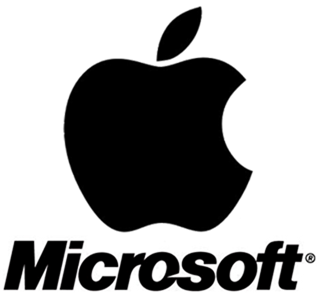 Apple’s revenues grew 413% since Q2 2007 while Microsoft’s grew 26%. The first result about Apple’s Mac business generating more revenue than Windows is completely understandable. This isn’t just because these Macs are sold at exorbitantly high prices, but also because how Apple has its chain of retail stores which sells only their products (no giving money to other outlets for displaying items) and they have their own operating systems (other companies pay Microsoft to sell Windows-powered PCs). Apple makes a lot of profit off every Mac they sell, while other companies struggle to do so. Windows is also just an operating system, so comparing that with a series of laptops/desktops is absolutely unfair. Comparing the mobile devices and related products of one company (Apple) are with the entire suite of products of another does seem like an unfair comparison. One would think that Microsoft would win with popular products like Windows, Microsoft Office, Xbox 360, Hotmail but that is not the case: Apple makes more money from iOS-powered devices than Microsoft from all its products. A little hard to swallow, no? According to iDB, the revenue-from-iDevices isn’t just iPhone/iPod touch/iPad hardware, but also software, percentage cuts from iTunes Store and peripherals. Still, that is a lot of money. 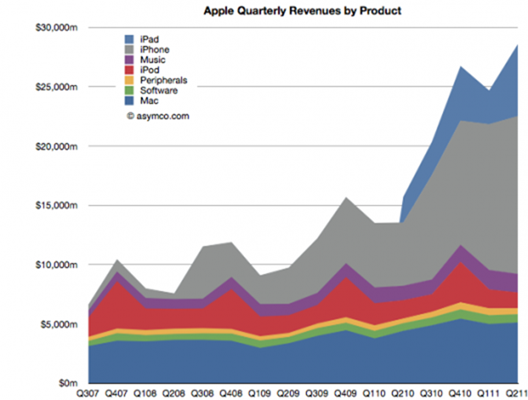 Apple’s revenues have exponentially increased over the past few years. The iPhone, iPod touch and iPad are all extremely popular products and simply dominate the smartphone, portable media player and tablet markets (respectively). Apple has Steve Jobs and his handpicked team of innovative, hard working engineers and designers to thank for all of this.